How to make money with facebook's 1.4 million dollars and adsense ? Home › Adsense › Facebook › Informasi › How to make money with facebook's 1.4 million dollars and adsense ? Many people think that arbitrage is no longer relevant..but they would be way wrong. I am going to show you how I made over $1.4 million dollars with arbitrage using Facebook and Google AdSense. There are a few small factors that people forget about when trying to be successful with arbitrage. In this article, I am going to go over how to increase AdSense revenue and decrease Facebook ad spend... resulting in higher profits and higher ROI. If you are not using Facebook Ads to drive traffic to your website, then you are missing out on a crucial vertical of quality web traffic that can boost your site to the next level. Many people have tried Facebook Ads by creating an ad with the default image and default targeting.. but don't get the results they are expecting. The key to Facebook Ads is getting high CTR (click-through rate) ads. When this happens your relevant score goes up which results in lower CPC (cost-per-click). When your CPC's are low, your profits raise... and this is the key. So how do you get higher CTR ads? Well, knowing your audience is one important piece. This allows you to target specific demographics which will weed out all those people that wouldn't have clicked on your ad. This will lower your CPC. Another very important piece of your Facebook Ad is your text and image. Using the default image that Facebook picks for you will most likely get you no results. Ads that stand out more will get more clicks so the key is to make a highly engaging ad with a targeted demographic. One great method I use to create high CTR Facebook Ads is to use text on the image. I use Adobe Photoshop but you can find many free tools that will allow you to do this. Facebook only allows 20% of text on a image... and I like to use the max amount. Use text colors that contrast with your image and make it pop. This will grab the readers eye and increase CTR. Increasing your AdSense revenue will also help raise profits. There are some great ways to do this that many people don't know about. A great tip to increase your AdSense revenue is to check out your placement on your site. How many ads do you have above the fold? Do you have ads in high traffic areas? Does your ad contrast with your page or blend in? Answering these questions can help raise AdSense CTR and CPC. Another important factor is having image and text ads enabled. When you only enabled one, you are missing out on possible revenue from advertisers. Its also important to use responsive ads. Many people are moving to their mobile phones for internet browsing and it's your job as a webmaster to make your site mobile friendly. Just having a mobile friendly site will increase your revenue by 15%. One of the most important parts of increasing AdSense revenue is to increase your pageviews. The more times someone browses through your site, the more chance of an ad getting clicked. Keeping users on your site is a very crucial part if you want to make anything with AdSense. Your pageviews per session should be higher than 3. Each extra pageview you get increases your chances of more revenue so have a user friendly site with engaging content that will make someone stay longer. Having a arbitrage management system is a necessary piece to this whole equation. Without the AMS system I used, I wouldn't have been able to make the amount of money I did. Having a place to see each Facebook ad campaign and coorelating AdSense pages/campaigns is the only way to make this amount of money. You can do it manually and do OK, but if you want to be very successful, you must use aarbitrage management system like this. I really like FissionAds because it automates everything for you. All you have to do is create good Facebook Ads and it auto bids on the ads for you based on your ROI and profit. You pretty much just set it and forget it. LikeHow I Made $1.4 Million With AdSense & Facebook CommentShareShare How I Made $1.4 Million With AdSense &amp;amp; Facebook. 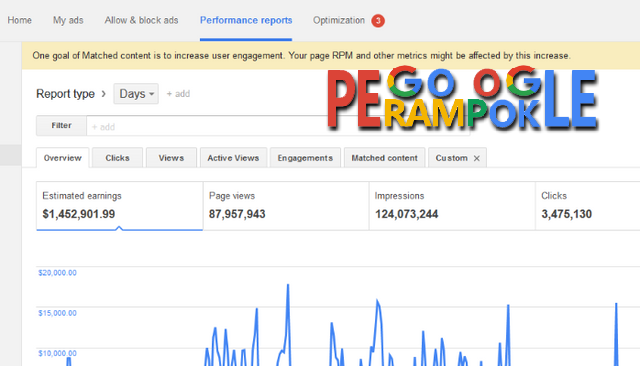 perampok google: How to make money with facebook's 1.4 million dollars and adsense ? "clickable"